One might think, traveling off the beaten path, that few people have been to certain places. But up and down this coastline of ours, all 27,200 kilometres (16,900 miles) that wind in and out of deep inlets and fjords, and around some 40,000 islands, big and small, one finds evidence of past human activity. Midden beaches mark the spots where First Nations harvested shellfish. Crumbling villages and rotting totem poles are all that remain from many settlements. From the nearer past, boarded up and falling down structures are all that's left of many people's dreams. On Tumbo Island, accessible only by boat, a house, a barn, and a tottering stone chimney bear silent witness to someone's hopes. Whoever lived in this cabin planted a couple of rosemary bushes that are now sprawling wildly. I picked a few sprigs and took them back to the boat. That same someone planted lavender, too, whose long spires were busy with bees. And who chose the colour of this door? She, or he, and I have something in common - an attraction to rosemary and lavender, this pretty blue - yet I know nothing of her. No name remains, only silent buildings and overgrown plants. Historical records tell us that the island was once used for coal mining (too deep), fur farming (mink and foxes), and that Chinese immigrants who worked in the mines grew a large market garden and rowed (!) the produce across the Strait of Georgia to White Rock (about 20 miles). An abandoned rowboat bakes in the sun. The island is now a park, although a small section is still privately owned and occasionally occupied. Remote settlements such as this became more rare as fishing and logging were commercialized and single operators just couldn't make a living. It's a quiet place to visit. The big pleasure boats don't stop here, as the anchorage is shallow and crisscrossed by shallow reefs. 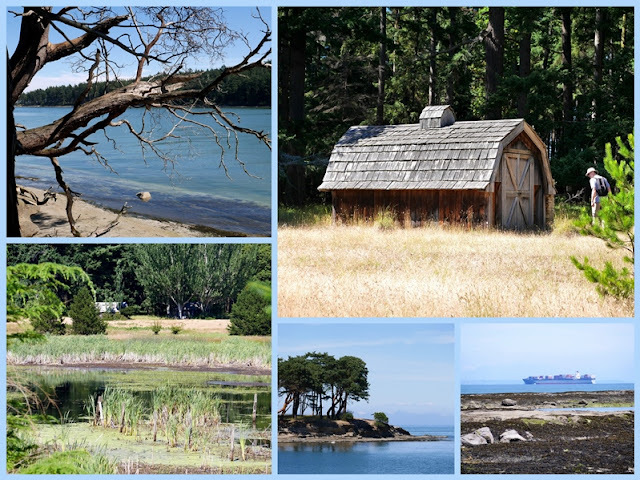 Across the Strait, the densely occupied BC and Washington coastlines are visible, and tanker boats and container ships sail by regularly, but Tumbo and Cabbage Islands drowse in the sun, hardly noticed by civilization. Love your photography...and the commentary. We so enjoy 'off the beaten path' travels. It's a little sad to think of the hopes and dreams of those dwellers. What a prolific Rosemary, I'm sure cutting will root easily and then you will have your own bit of history! That looks like an interesting place to visit. The overgrown rosemary and lavender are so neat! BEautiful images. What stories Tumbo Island could tell! Love the blue door. I have a blue door. I lived in New Mexico for many years and a blue door was good luck. I hope it was good luck for the one who planted the rosemary and lavender. Happy Monday! I loved this post. It is so sad to see vacant buildings but I love the looks of the weathered wood. Beautiful images, Lorrie, they evoke the feeling of times gone by and our imagination conjures up the people who inhabited this wild place off the beaten track, planting herbs and choosing paint colours to rights up a homely cottage or fishing boat. Happy Mosaic Monday from Florida! You make the place beautiful again, and occupied by dreams for a better future. I loved reading this post and looking at your beautiful photos! How intriguing to find the cabin with the rosemary and lavender growing wild, plus a blue door. I would have been so curious. I love your adventures in your area. I would have been intrigued by the blue door too! Thank you for taking us on another interesting island tour. I just love visiting abandoned places and have an upcoming blog post about one. I think with rosemary and lavender I would have had something in common with the previous owners. Now that I'm thinking of rosemary...just how cold does it get in your winters? It must not be as cold as I think if Rosemary lives there. There’s not only something sad and lonely about the abandoned places but also some surprising beauty. I’m also intrigued by the wooden door painted blue. Fleeting prosperity and then decline, but nice to know the island is a park now. Beautiful photos, a little daunting to think about a bygone era and wonder about someone's hopes and dreams. Such a shame that some of the buildings couldn't be restored. What a fascinating place to visit, it must have felt very isolated for the people who lived there. How amazing to get a glimpse of the past and wonder what might of been. There are so many wonderful places to visit out there. Such interesting things you've discovered off the beaten path and all undoubtedly with a story. I do wonder about the hopes and dreams of the one who chose the color and painted that door. I hope there were years to enjoy it. Thanks for an enjoyable, thought-provoking post today! You are a "seer," Lorrie. I love how you made a connection to those whose paths you followed so many years later . . . seeing their loves and choices and moments across the years. Lorrie - this post is so beautifully written - I felt that I was there with you. And then the pictures brought your words to life ... what a moving way to memorialize those who went before. Thank you for this gift. Poignant and evocative....and perfectly illustrated by your photos. I hope the people who tried to make a life here succeeded somewhere else later. It's great that you are able to boat to a beautiful quiet place like this away from the bustle of everyday life.